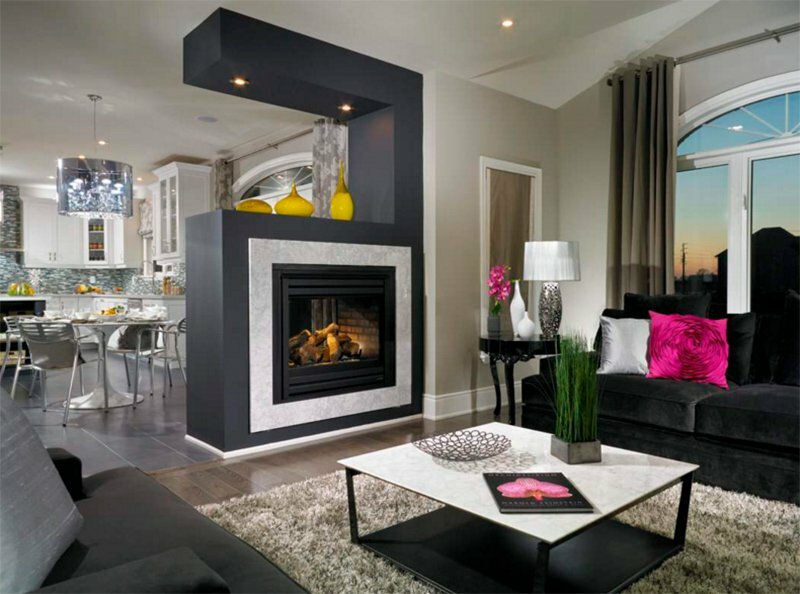 A double-sided fireplace could also be a good idea for a divider in the interior. Most homes would have a fireplace especially if you are located in an area where there is winter and where the weather is cold. It would be very comfortable to sit near the fire and read a book or just relax. What adds to the wonderful feel of the space is its manner of arrangement as well as the decors that are added to it. Speaking of fireplace, there are different kinds of fireplace designs that one can use for the home and what we will showcase today are double sided ones that can provide warmth to sides of the house. A fireplace is usually included as a focal point in the house. With that, it would oftentimes have a beautiful design that will bring some lovely appeal to the space. And of course, it can also provide you the heat that you need whenever you feel cold. But aside from that, a fireplace can also be effectively used as a divider to separate interior rooms. With that, it can be enjoyed on both areas of the house. 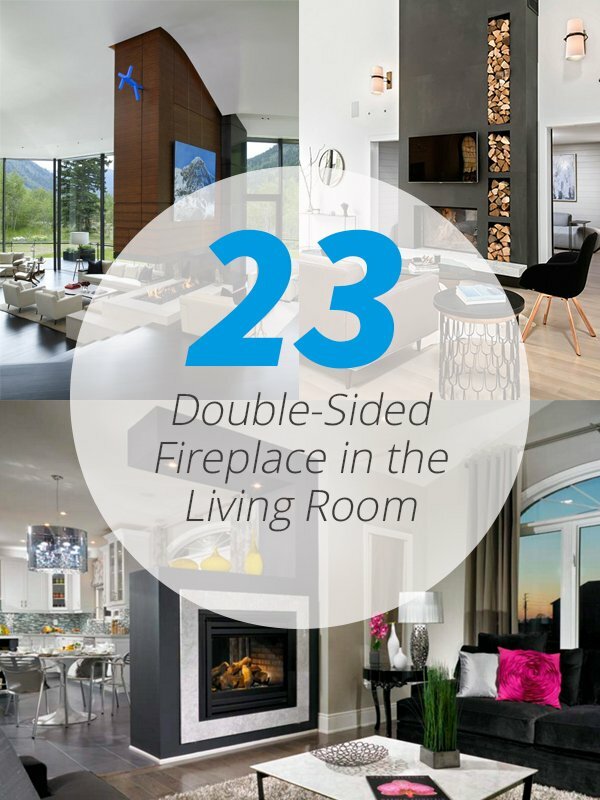 Let us take a look at some double-sided fireplace designs in the living room below. 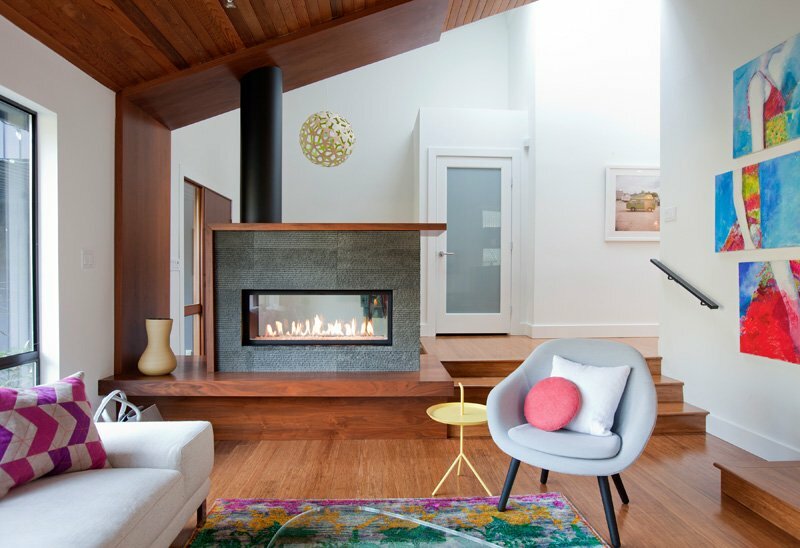 A remodeled home in Vancouver, Canada has a beautiful contemporary fireplace that can be seen from the entrance way and the living room. I like the idea of having this fireplace on the elevated entryway. 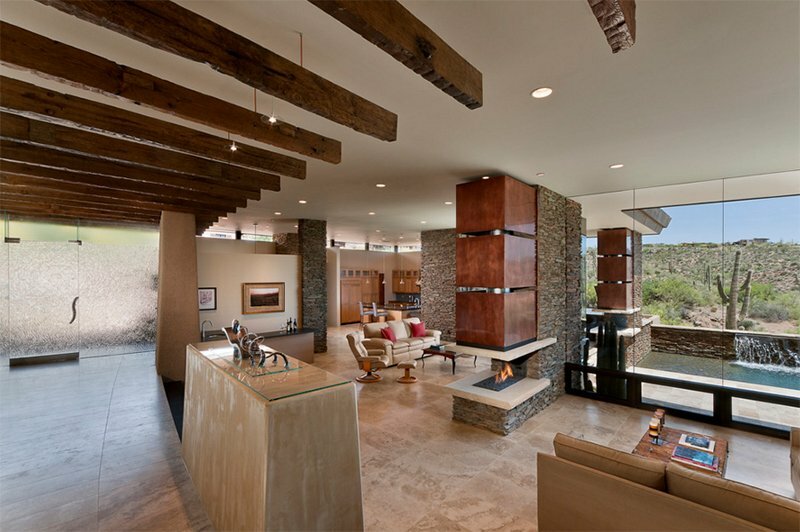 This home has two living areas and was separated by a fireplace with stones. Isn’t it nice? Another home with a spacious living area. Since the owner wanted to seating areas, then a fireplace is a nice way to create a division between them. 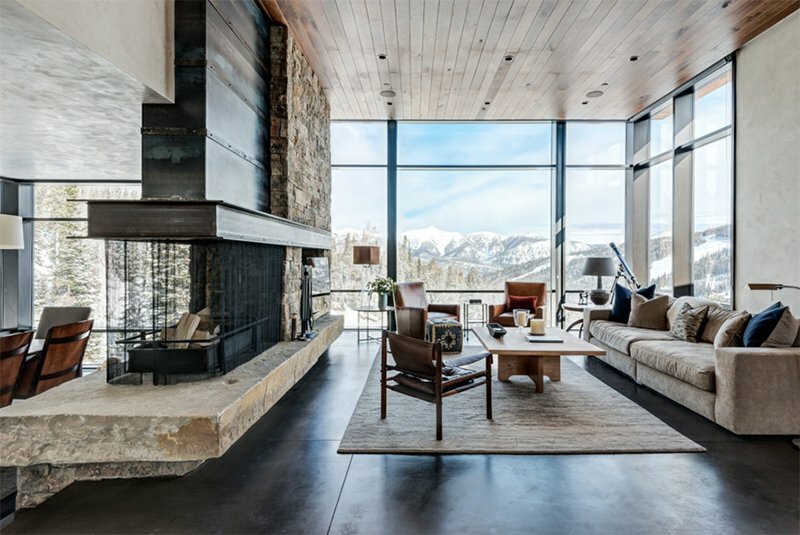 A renovated home in Aspen, Colorado has a beautiful floor to ceiling fireplace wherein the upper level has wood on it while the lower part uses concrete. This fireplace separates the space between the two levels since the other one is higher. And look at that interesting human-inspired decor that seems to walk on the fireplace! A traditional fireplace design with some molding on its frame. It looks good with white around the brick texture, right? And it also compliments with the other elements in here like the wooden coffee table and the area rug. 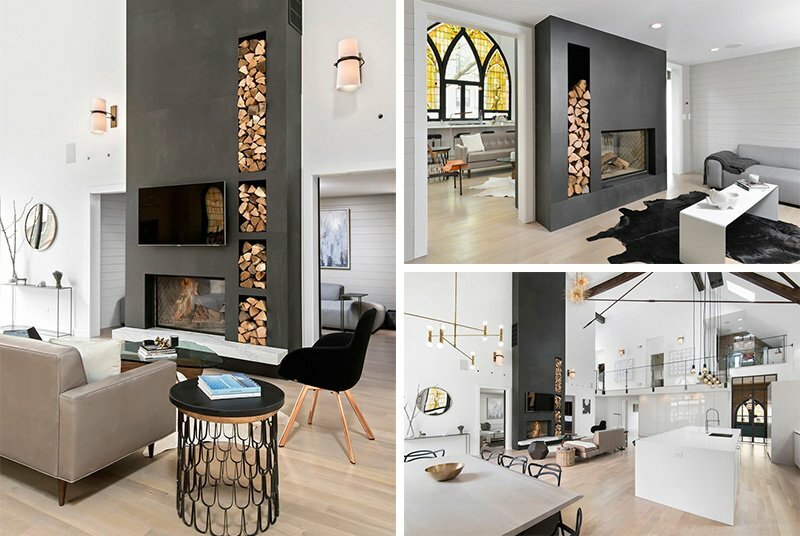 A converted church in Chicago has a fireplace that splits two living areas. But it isn’t an ordinary fireplace because aside from towering from the floor to the ceiling, it also has storage for firewood too which actually adds to its beauty. A big fireplace covered in stones that allow you to take a look at the dining area on the other side. With the looks of it, this is indeed a spacious home. 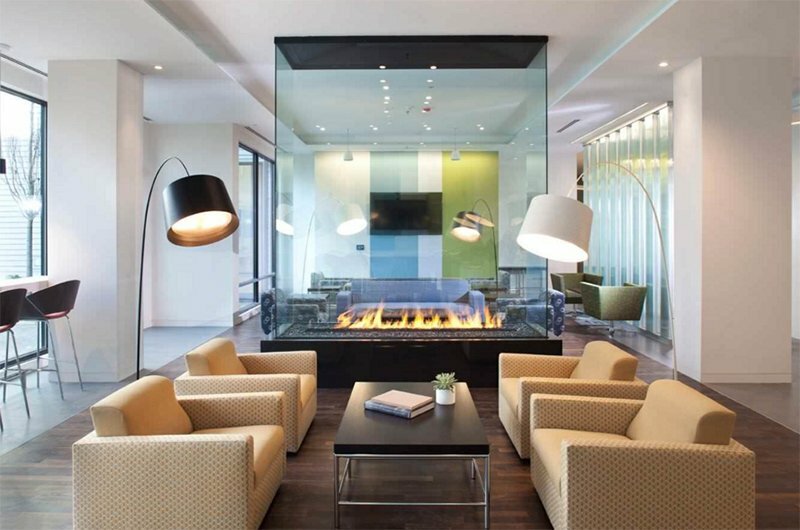 Another awesome idea for a double-sided fireplace is a custom gas fireplace that is made from glass. It used a slightly tinted glass that runs around the entire enclosure and all the way to the ceiling. The patterns of the chairs definitely standout because the other elements here are all plain. Another thing that is attractive is the design of the fireplace wherein two sides can bear a fire. 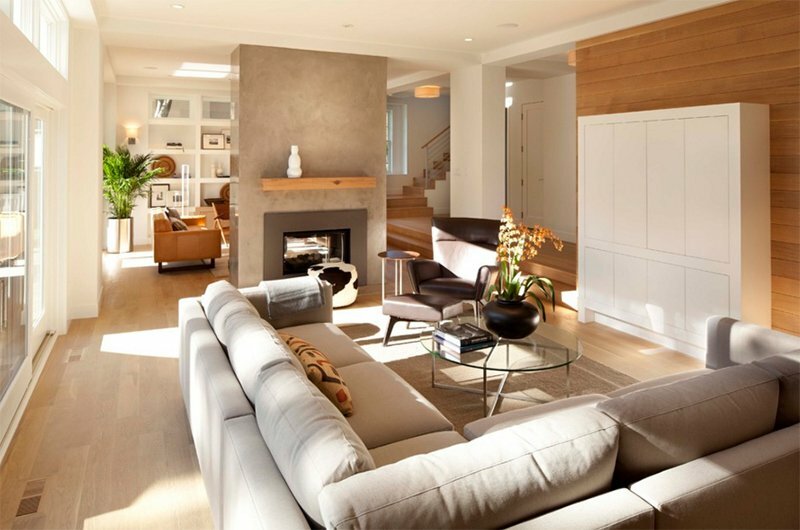 This contemporary living area seems like located in a penthouse or in a condo. Notice its use of contrasting colors and the addition of shelves above the double-sided fireplace. 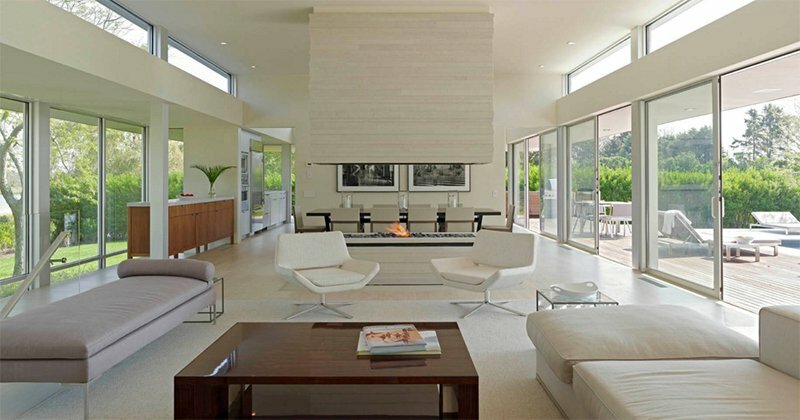 This modern fireplace has a custom mantel where yellow vases of different colors were added. Looking nice right? It does especially that the fireplace is black in color. A luxurious home with a long glossy fireplace. It adds to the sophistication of this home and it also compliments with the other colors used in the area. This fireplace has an eclectic mix of materials from steel to stones. The bottom part is even made from concrete. 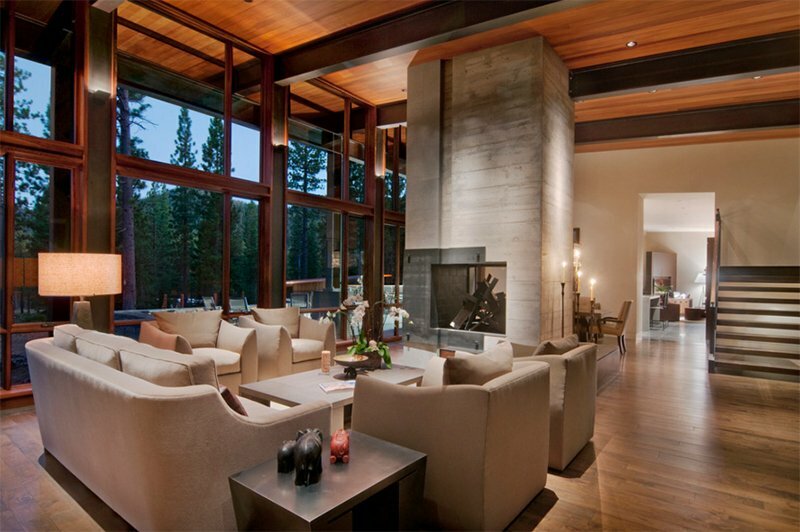 I am sure you will love this one because of its design and how it divides the living and dining area. Notice that the dining area is lower that then living space. 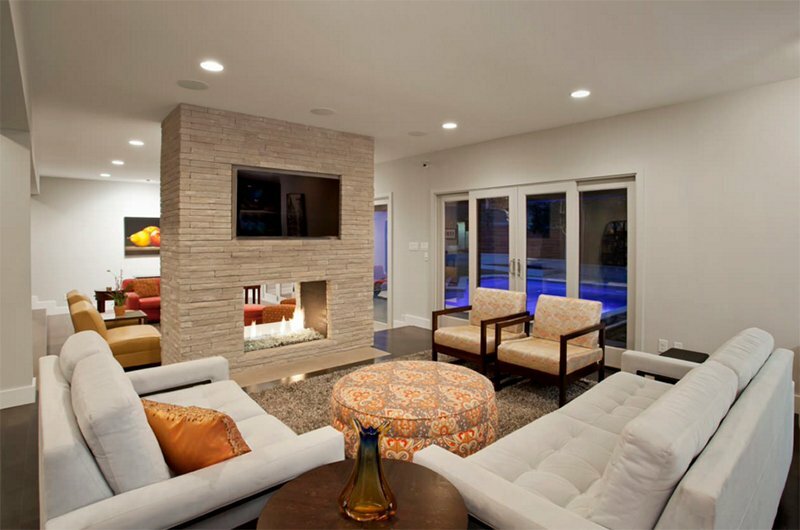 Another contemporary home with a fireplace that also holds the television and separates it from the dining space. 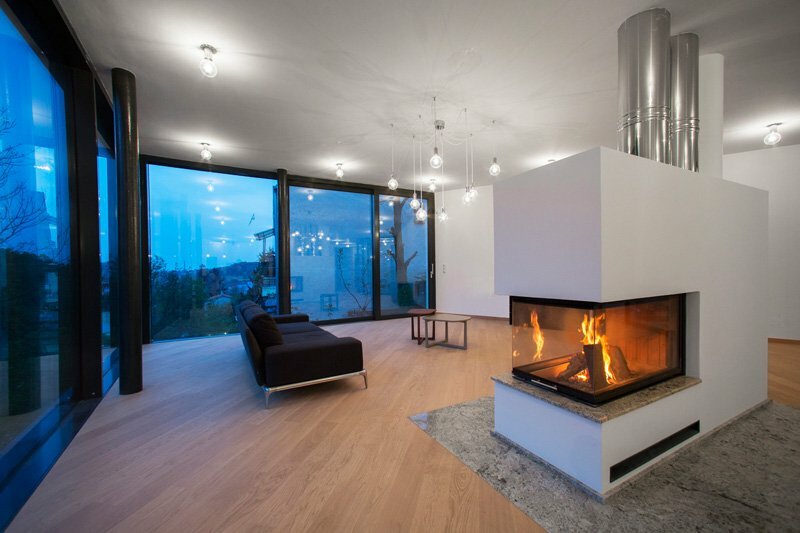 A home in Slovakia has a fireplace that is the central focal point for the living areas. Isn’t this a simple living space surrounded by glass? Look at this design of the fireplace. It seems to have a void at the center part but of course, it still successfully played its role in the home. For a white and gray interior, this design could be nice for a fireplace. You can see that the dining area is elevated from the living space. Another fireplace design that used a mix of wood and stones in it. It looks really nice, right? It sure is a focal point in the interior. 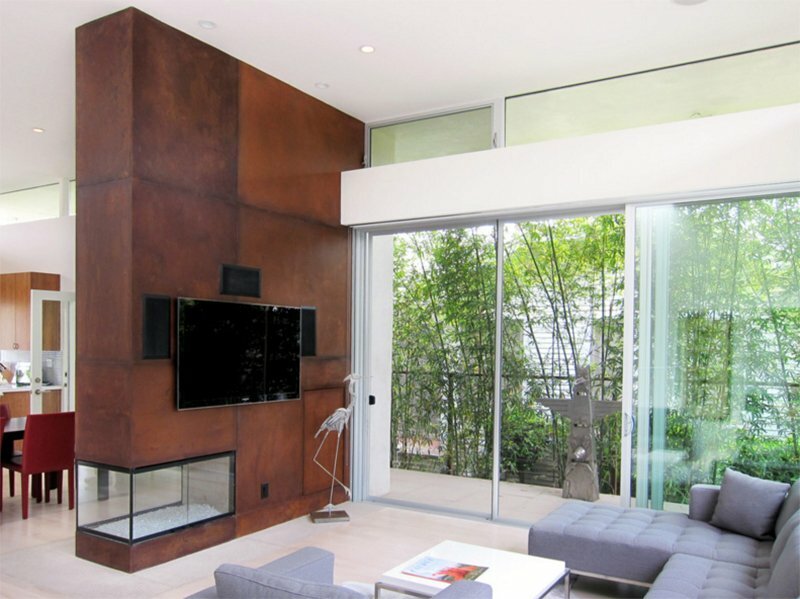 This home use corten steel for its fireplace and divider. Aside from that, it also holds the television as well so that the owners can relax around the fire while watching TV. The finish of the fireplace is like that of sand. It seems right to add that picture on it since it seems to reflect the design of the fireplace as well as the fire in it through the sunset. A lovely fireplace with gray tile finish is seen here. You can even take a peep of the dining area on the other side. Aside from the fireplace, I like what they did to the wall decor. 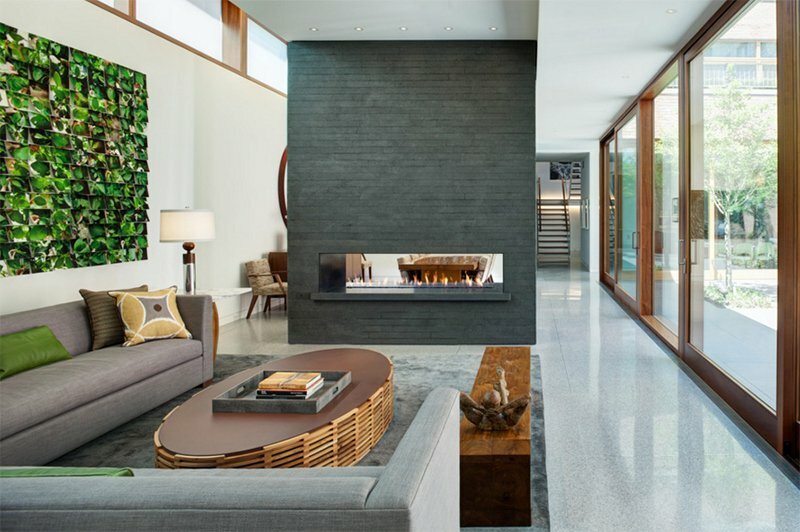 Many homeowners are not expecting that a concrete fireplace could be a nice way to bring appeal to your home but it does just like what you can see in the photo for a double-sided fireplace. 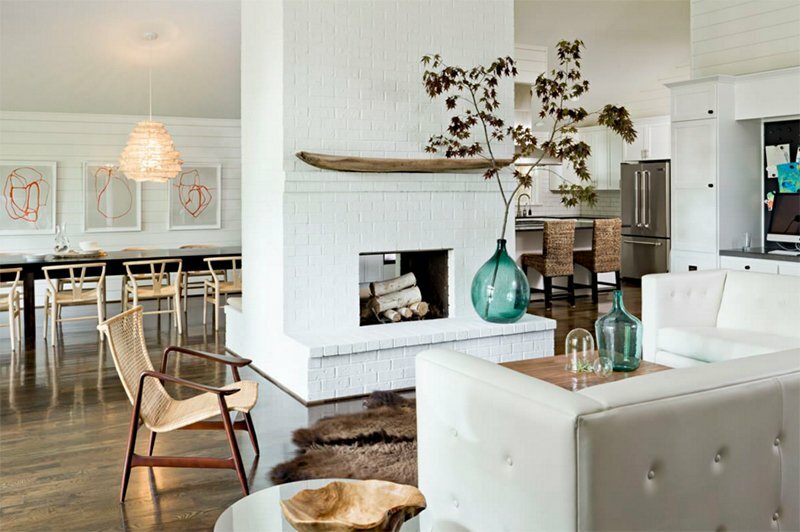 Paint an old brick fireplace with white and add some lovely decors on it to upgrade its look. You can also see the different furniture made of wood here that added some natural touch to the space. It would really be nice to have a double-sided fireplace for the home so that it will not merely be used for one side but also for the other. This way, you can spread the warmth all around the house. Aside from that, it would also be an added decor for the interior especially if your fireplace has a beautiful design. I know you have seen the gorgeous fireplace designs above that can give you ideas on what to do with your own fireplace in your home. You can use a design that will upgrade the look of your interior. So, do you have a favorite fireplace design that was found in the interiors above? Let us know and tell us why you like it.